CURATED BY PERCEPTION SCIENTIST SERGEI GEPSHTEIN AND NARRATIVE DESIGNER ALEX McDOWELL, this one-day symposium will celebrate and promote the increasingly important interaction between two hitherto distinct communities: researchers engaged in the scientific study of human perception and action and researchers of interactive and immersive narrative media technologies in architecture, games, cinema, and new media arts. Thought leaders from both communities will discuss human behavior and conscious experience in physical, social, and imagined realities represented in purely virtual worlds, as well as in the 'mixed' worlds that interlace physical and virtual realities. The symposium will comprise a series of illustrated sessions each featuring two speakers: a scientist and an artist or immersive-reality practitioner. The speakers will first paint a general picture of their approaches and then explore current and prospective links between their domains of expertise. Following each session, generous time will be devoted to discussion and questions from the audience. Attendees are invited to learn about cutting-edge research of consciousness using reduced-price day passes to the ASSC conference. Student discounts apply. Mix with conference participants at the banquet on July 14 and conference "after-party on the beach" on July 15. Purchase your ticket to this unique symposium: Perception and Action in Immersive Worlds. Join in the conversation on twitter by using the hashtag #PerceptionAction. Learn more about the speakers and ASSC 17. Special thanks to Juan DiazB for content coordination and Wayne Chang for design services. © 2013, 5D | The Future of Immersive Design. 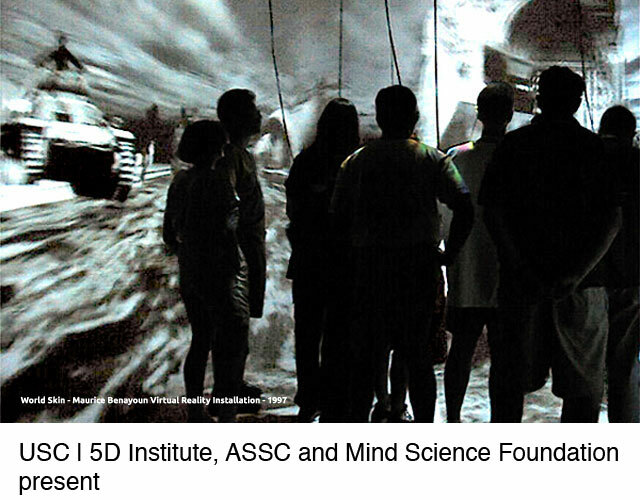 5D thanks its founder partners USC, ADG, UAM, and Autodesk for their continued support.